When you need to carry the office with you and still maintain a professional appearance, the Versa Premium Laptop Briefcase is the obvious choice. Leather handles and accents add sophisticated style, while an expertly arranged interior protects your electronics and keeps all of your files and accessories organized and easy to find. When you’re looking for a professional laptop bag with classic styling, top of the line materials, and innovative organizational capabilities, choose the Versa series of laptop bags. 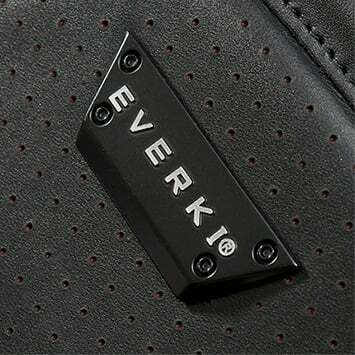 EVERKI’s Versa series is the perfect marriage of subtle style and extreme organization, with all the attention to detail and intuitive features you’ve come to expect from EVERKI bags. These bags are dressed to impress with high-quality ballistic nylon, clean lines and sleek profile, and enhanced with black on black premium leather accents and handles. Each bag in the Versa series ensure that you can remain tailored, structured and organized when you travel or walk into a business meeting. The Versa series of laptop bags – classic style, contemporary features. The Versa Premium Laptop Briefcase makes the most of every inch of space on the inside, and still wows with its stylish exterior. The most important piece of equipment – your 16-inch laptop – is secured in a felt-lined pocket with our patented corner-guard protection system located in its own dedicated Checkpoint Friendly compartment. 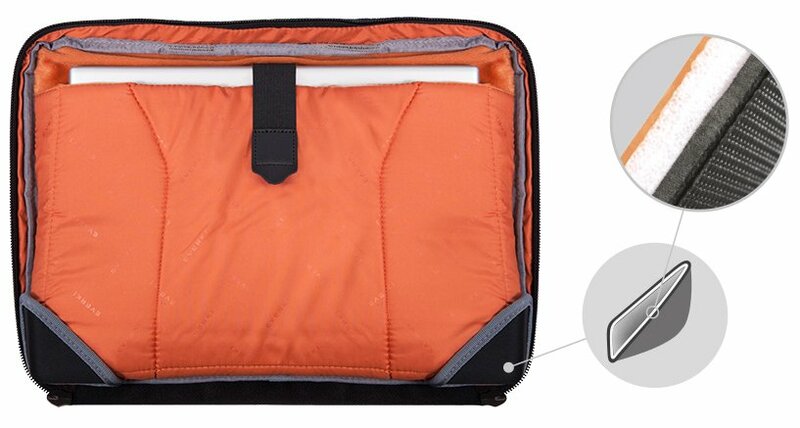 You’ll also find a smart, double-sided organization panel replete with pockets and slots on both sides, a padded, felt-lined iPad/Kindle/tablet slot located safely near the center of the bag, and a separate compartment which reserves space for important files and documents. Plus, you won’t find the Versa Briefcase short on style with its black on black exterior, water-repellent ballistic nylon and premium leather accents. Professionalism, quality, style. 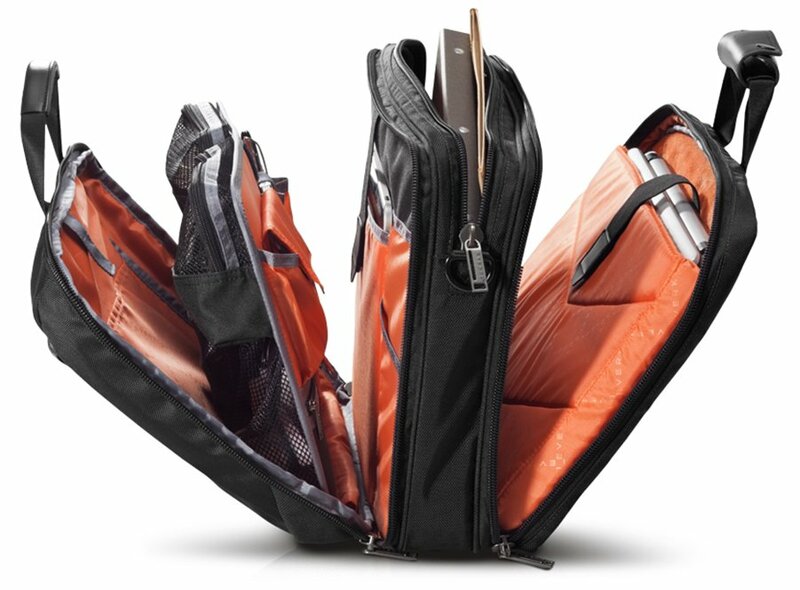 Airport security can be a hassle, so we designed the Versa Briefcase with our hassle-free 180 degree fold-out design. The Checkpoint Friendly laptop design allows you to breeze through airport security without removing your device from its pocket. Simply open the Versa up 180 degrees, lay it flat, and your bag will quickly pass through the scanner. Should you need to remove your laptop, you can take it out and replace it without rummaging through your briefcase or removing other contents. When you travel with your briefcase as your mobile office, your laptop has to be securely protected. That’s why we’ve engineered the Versa Briefcase with extra padding in the lining of the laptop pocket and molded-to-fit laptop corner guards. Our patented corner-guard protection system uses form-fitting corners to wrap snugly around the bottom of your laptop pocket, to protect against knocks and bumps – or if you accidentally set your bag down too abruptly. The shock-absorbing system of the Versa Briefcase will give you peace of mind, knowing your laptop is safe inside your bag. 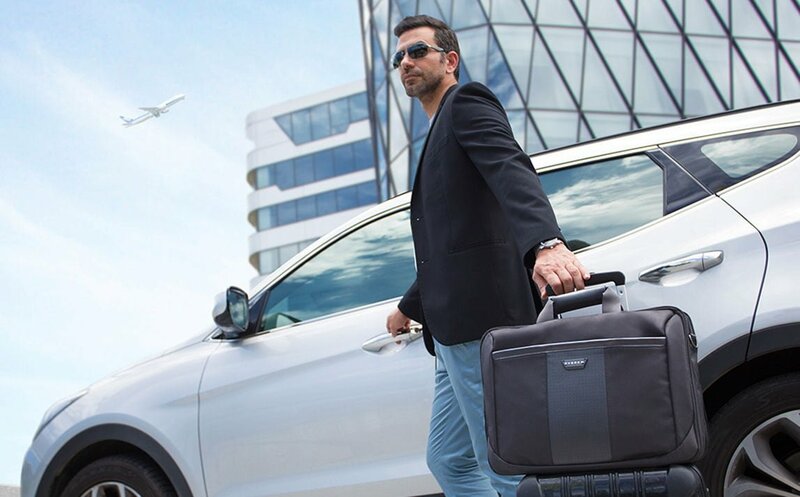 The Versa Briefcase’s well-ordered interior makes it an absolute asset for the traveling professional. Its main compartment features an innovative, structured panel with two sides of pockets, slots and pouches for maximum organization. Hidden out of sight on the backside of the panel, you’ll find several zippered, see-through pockets for tidy storage of cables, peripherals or toiletries; while the visible business side of the panel is equipped with plenty of individual spaces for business cards, pens and passport. Plus, everything stays put when the panel is securely fastened with the top strap. Maximize efficiency, minimize mess. To nicely round out the classic styling, we used premium leather accents on the black on black Versa Briefcase which are subtle, yet striking. Professional enough to take into a board meeting, yet spacious enough for a business flight. Classic, subtle, sleek. When traveling with many bags, the trolley handle pass-through on the back of the Versa Briefcase allows you to double your efforts. Simply slip the Versa onto the handle of your luggage and you’re ready to wheel through the airport. Rushing through the airport is no problem with the Versa Briefcase, even with a full load. 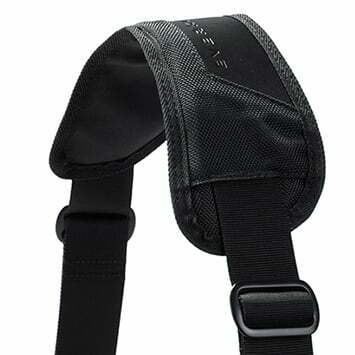 An ergonomic, two-way adjustable shoulder strap allows fine adjustments for maximum comfort; and its wide, soft, leather pad prevents slipping while it also pitches in to absorb some of the weight. All EVERKI interiors are stylish, high-contrast orange because we know how frustrating it is to mistakenly leave a compartment unzipped, and how difficult it is to organize against a black background. Savvy and Stylish. EVERKI makes products of value because we value our relationships. 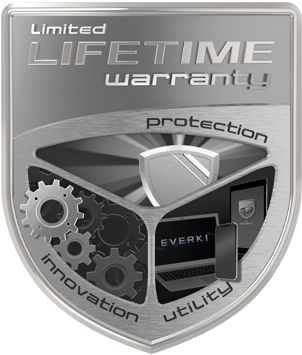 Every product EVERKI makes comes with our Limited Lifetime Warranty which covers manufacturing defects over the entire life of the product. EVERKI. We give you peace of mind. This is one terrific bag. After toting Tumi briefcases for many years (and paying dearly for them), it became clear that they were ill-suited for the electronic gizmos executives carry today--laptops, iPads, chargers, headphones, etc. I did a lot of searching for an alternative and ultimately found this case. It was perfectly designed and beautifully built to meet these needs. I couldn't be happier. I decided to move out of a backpack and into a briefcase and found the EKB427. This briefcase is professional looking, yet built like a you would expect. The check point friendly feature is worth the price alone but they have added so many more features. I especially appreciate the felt lined sections for my tablet and laptop. 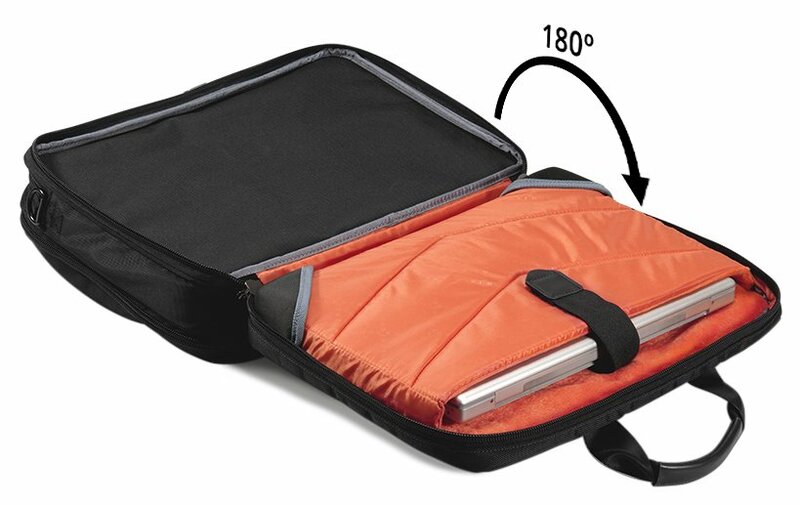 I can get all of my papers, electronics, cords and more without a big bulging case at my side. 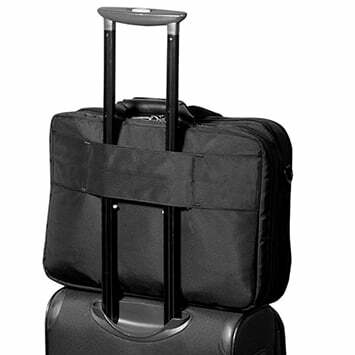 If you couple this with a 4 wheel rolling bag you have the perfect business traveling set up. You can stop looking, I have done that for you. Order this briefcase and you won't be disappointed.  This is my THIRD Everki product, and they just keep getting better and better! My most recent Lunar bag (4 years old!) is still in perfect condition; however, a new, smaller laptop necessitated the acquisition of a smaller briefcase to accommodate. One can easily tell Everki's continuous improvement process works perfectly: this bag is loaded with upgrades. NOT silly, useless features ... rather, innovative solutions which must have been conceived by people who actually use the briefcases for real work and travel! One opportunity for improvement: the shoulder strap pad is still too slippery ... it doesn't GRIP, it slides. Otherwise, the entire product is flawless. Buy anything Everki makes, especially this bag. You will NOT be disappointed! Extremely pleased with this backpack. Purchased directly thru Everki and received the pack within 2 days! (Probably helps to live in SoCal!) The checkpoint feature and pass thru trolley handle stood out in the airport. Great for travel and one shouldered carry! !